Posted June 15, 2016 by Dan Weisberg & filed under Uncategorized. My name is Randi Colton and I am a CPR and First Aid instructor. I am currently in the Leadership Rockland class of 2016. I was on the assignment for their health and emergency service day when I used my life saving skills for the first time…. To happen to be in the right place and the right time is a miracle – however, this would not have happened if the actions of others were different. Last year’s Leadership Rockland class were unable to decide on what groups and what health care agencies they were going to visit…. Apparently they took too long deciding which group they would be in and where they would go…. Because of this, our Leadership Rockland class was preassigned to specific groups. I was put in the group to go to Office of the Aging with four others… If I had to choose among the five groups of health agencies, I would not have picked Office of the Aging; I would have picked one more closely aligned with my CPR interests. Once we had our groups and where we would be going, we decided that we would be interviewing the office’s director, June. We had to coordinate six schedules and decided that we would be going on Wednesday, February 24 at 12:30 PM. I remember it was a very cold and rainy day. I got there early and I saw one of my teammates, Ben, in his car. We walked in together and waited in the lobby for the others. I had noticed that there was an AED on the wall and I thought I will ask later on who certifies them in training. Once we had the majority of our group, we went into June’s office. We had made some small talk before we got started on interviewing her. After the interview, June offered us a tour of the building. During the tour I was in the back. As we were coming back towards June’s office I ended up being in the front and I was going to go ask her where the bathroom was, until we arrived at a closed door and that is when we saw an employee of the Office of the Aging, collapsed on the floor in front of his desk. June and I both said, oh my goodness he’s on the floor. That was when I opened up the door and checked for a quick scene safety. I had noticed his lunch was on the floor and he was 90% on the floor but his arm was still hanging off the chair. I immediately took action. I yelled “Sir, sir, are you OK are you OK sir are you OK!” He was not responding. There was a woman by the door and I told her to go call 911 and go get the AED. I’ve then checked for breathing and there was no breathing and he also had no pulse. His mouth and both eyes were open and he was blue. My immediate thought was that he had choked on his lunch. I unbuttoned his shirt and pulled his T-shirt up and I started compressions right away. I remember either the second or third compression I felt ribs crack. I kept going. I wasn’t even thinking, I was just doing what I knew had to get done and I did it. The AED arrived in a minute or so later, and I immediately said out loud – first thing you do is open it up and turn it on. I turned it on and I immediately applied the pads to his chest. I had made sure everyone stood clear – it was analyzing and then I made sure everyone was clear when it shocked him. I had known that the AED would make his muscles jump, but did not realize how much of a jump it was, and I also jumped. I continued with two minutes of CPR, with more chest compressions only. After two minutes the AED analyzed his heart rhythm and said shock was needed. I gave him a second shock. Once he was shocked I had another woman, Sharon, take over with compressions while I took a break. I did not want to take a break however I knew in order to give high-quality CPR I would need to take a break. While she was doing chest compressions only I saw that there was a first aid kit with the AED and found a pocket mask. I was like a kid in a candy store and said to myself, oh great I can ventilate now. Sharon continued to do chest compressions well – I encouraged her, saying, I am so proud of you, and you’re doing a great job, whatever the outcome is, you are doing your best, keep going, and you’re doing awesome. While she was doing chest compressions, I was checking for a pulse to see if I could feel anything. After she did two minutes the AED analyzed again; at that point I gave him his 3rd shock. Once he had the shock I was able to give CPR with ventilations. After my 30 compressions I used the pocket mask to give a breath – much to my surprise I saw his chest rise so I knew he did not choke and that he had a clear airway. I knew it was cardiac arrest. I continued to do about five cycles which was approximately two minutes of CPR. The AED started to analyze and I could hear the paramedics coming. The AED said that there was no shock needed so I had resumed CPR. From the time the woman called 911 and paramedics had arrived it was eight minutes. I watched them work on the man. They set up the Lucas machine and they also intubated him. I had asked if they wanted me to help ventilate since I knew how to use the BVM. They did not take my offer. I continued to watch them do their job. Once he was hooked up to the medication and had everything stable, they then took him and brought him to Good Samaritan Hospital. Once they left I could not believe what had happened. I remember coming out of the room and checking to see how everyone was doing. During my compressions only I had asked Nina from my group to make sure that everyone was OK. Not only was I working inside the office but I was also concerned and making sure everyone outside his office was OK. I went to Sharon and I talked to her to let her know that she did an amazing job and then I was so proud of her regardless of the outcome. I also told the staff that were there that they did an amazing job and that everything went perfectly – it was pure textbook CPR. I also reassured them that he did not go down from choking and that it was cardiac arrest. After about 20 to 30 minutes of just sitting and realizing what had happened, I was able to drive home. I sat in my car for a few minutes just trying to understand what had just happened. I kept thinking, I am a CPR instructor and I teach people what to do in case of an emergency, however I never thought that I would be having that exact experience that I teach. After getting lots and lots of hugs and thank yous, I was able to drive home. I had called my husband after I had given the man CPR. Once I got home I then called my friend Bob who is my CPR mentor. I also called my mom and stepdad. I was so proud of what I had done, however I didn’t think he would make it to the hospital alive. I just kept picturing him being so blue. No one knows how long he was down, maybe 5 to 10 minutes, maybe 10 to 15 minutes, or even 20 minutes… no one really knows. He had gone to heat up his lunch, went into his office and that was how we found him. Wednesday night I did not sleep at all. Partially because of the blackout that we had due to bad weather, and partly from what I had done. Thursday morning I called June at Office of the Aging and she had told me that he was in an induced coma and that he was alive. She also mentioned that his family would be making a decision sometime on Friday on how to proceed. I was so surprised to find out that he was alive. I had saved a life. Thursday afternoon I was scheduled to give a CPR lunch and learn at a corporation in Mahwah, New Jersey. I was debating on canceling not because I didn’t want to go, but because of my lack of sleep the night before. It turns out I was still on my adrenaline high and that was what kept me going. Right before the CPR lunch and learn, I actually did some compressions and ventilations on the manikin. I had to get that out of my system since the last time I had done CPR was less than 24 hours ago on a human being. The CPR lunch and learn went extremely well – I was able to talk about my experience and the participants appreciated my story. I realize that after this experience I will teach CPR completely differently now. I learned CPR in health class when I was 15 years old. That was 27 years ago. I have been a CPR instructor for over 10 years and I never once thought I would actually have this experience. Later on in the afternoon I got a phone call from Danielle Watson, coordinator of Leadership Rockland, saying how proud she was of me and that she had heard about what had happened. I also got a phone call from Desiree from Rockland EMS letting me know that the man had had a pulse of 10 when they took over, and by the time he got to the hospital he had a pulse of 100 because of all the medications they had given him. She also told me that they were able to catheterize him with no problem and that he was in an induced coma. She had mentioned that the County Executive’s publicist and possibly News 12 might contact me. I was still in shock of what had happened and how the news of what I had done was spreading. The next day I was scheduled to teach a CPR class at the hospital with two other instructors. Thank goodness they were there because I was starting to have flashbacks of what had happened two days prior. I was talking to my friend Mark who is also a CPR instructor and he was telling me that this man may have a really good chance of surviving. After the class I was driving home. I remember getting a phone call while I was driving however I let it go right to voicemail since I don’t like to drive and talk if I can avoid it. I pulled into my garage about 4 o’clock and I sat in my car and I listened to the voicemail. June had left a message thanking me for what I had done and also that his family said that he had very little brain activity and that they were going to let him pass peacefully and take him off the ventilator. Once I heard that news I lost it. I just sat in my car and bawled heavily for about five minutes. I called her back and I told her how sorry I was. I also told Mark what happened also. That Friday night I had told my friend that I would bring her daughter to a Girl Scout beach dance party at the school. I did not want to go however, I knew I needed to go after the news I just got. I was so glad I went. It was just what I needed – I danced and I hung out with my friends. It was the perfect distraction to what had happened the last 48 hours. Saturday I was able to rest and noticed that I started to have some post-traumatic stress. That night I ended up talking to my friend Mark for almost 3 hours. I needed to talk. I also had talked to my friend John who had given CPR to a man in his driveway that did not make it. I was really starting to feel the implications of what I had done. I was hoping for a full recovery and that one day I would be able to talk to the person I saved. That is not the case, but instead I have given him two days of being alive for his family to be with him and for them to make that decision. I gave them the gift of his life. I also gave the gift of having his coworkers know that he did not die in his office that day and that he was able to die with his loved ones at the hospital two days later. I had given everyone this gift that would not have happened if I were not there and took action. 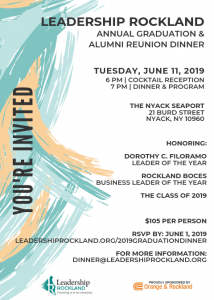 Going back to what happened in last year’s Leadership Rockland class and having that class take a long time to decide on groups had given me the opportunity to be where I was supposed to be and do what I had to do. Their actions had set the stage for me to save this man’s life. Sunday I saw the man’s obituary online and found out that he had indeed passed away on Friday. I had noticed that he would have been 70 years old on June 26 of this year. June 26 will be when my son Sam turns 11. Seeing that information made me feel even sadder. Sunday Afternoon I taught a CPR class at a yoga studio in Congers. This was my first one by myself since saving the man’s life. It was one of my best classes I have ever taught because I was able to share my story and my experience. Monday morning I got a phone call from June from Office of the Aging letting me know when the funeral arrangements would be. I told her I would be there Wednesday around 12:30 to pay my condolences. Afterward, I ended up doing a double session of kickboxing and later did a karate session at night, as I really needed it. Tuesday I went to work and I taught two CPR/First Aid classes that day. My classes are so different now that I have had this experience. This had made me a better instructor. Wednesday I taught at a corporation for six students. I had told them what had happened and that I was planning on going to the wake later on. After my corporation class, I drove to the funeral home in Suffern. I walked into the funeral home and there were about 12 to 15 people there and it was an open casket. I was happy to see an open casket since I wanted to see a better visual of him than when I had last seen him, collapsed on the floor being blue. The man in the casket did not look like the man I had saved. He looked puffy however, it was a much nicer looking man then the image I had in my head. After sitting for about 5 to 10 minutes by myself and just staring at the scene, I got up to go talk to June. She had introduced me to Frank, one of his brothers, who lives in Westchester. I told him how sorry I was and he thanked me. I also talked to the women from the office that were there and told them how sorry I was. I went up to the casket to pay my respects. It was something that was so surreal because the man that was laying there was a man that I had saved. There was a small prayer and then the contingent were going to be heading to Westchester for the burial. He was a veteran and they were going to have a special veteran’s service. I did not go to the service, however on the drive home I had finally had some of the closure that I had been seeking. Wednesday night was our Leadership Rockland open house and alumni event. I went to the dinner and word had gotten around even more of what I had done. I was glad that many people were finding out about what I had done for this man. I was being called a hero and a lifesaver. Throughout the week I have gotten emails and phone calls from people telling me how proud they were and thanking me for the gift I had given to his family. Thursday after work I went to go have a two hour massage in Mahwah. I needed it to get the stress out of my body and the tension. After my massage and having some closure, I felt like a new person. I was starting to feel like myself after having this roller coaster of a ride. I will continue to share my story and teach people life-saving skills. You never really know when they will come in handy. I am very thankful I was able to give this man two more days of life so he could be with his family. This experience has changed me both personally and professionally. I hope others will read this and feel inspired to learn CPR and maybe one day can be in a position to save a life.